Are you a business owner in West Palm Beach? Do you own a commercial property and lease it to tenants? If so, you likely already know the importance of keeping your facilities pest free — and when it is time for you to do so, it is important that you contact us here at Native Pest Management, your dependable source of commercial pest control in West Palm Beach. We look forward to working with you and creating a pest-free business environment. At Native pest management we strongly adhere to the principles of integrated pest management — because our goal is not so simply remove pest from your business, it is also to keep them away and deter them from trying to enter the threshold of your commercial property ever again. 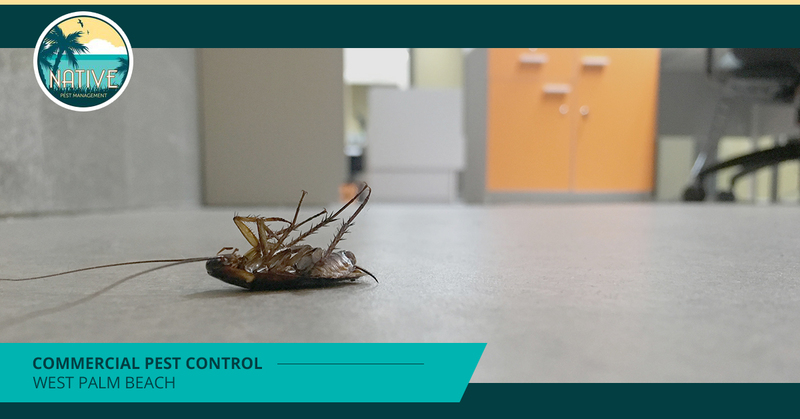 By setting actionable thresholds for pest population control, identifying and monitoring pest populations, preventing those populations from establishing themselves, and setting controllable boundaries to prevent their return, Native Pest Management can help you take back control of your property. If you have any questions about integrated pest management, or what our team of pest control professionals might be able to do to implement an integrative control plan, please don’t hesitate to contact us today! Regardless of if you have a current pest infestation or are wary about future pest infestations, it is important that you get in touch with us at Native Pest Management. Not only do we provide commercial pest control in West Palm Beach when you find an infestation, but we also specialize in pest exclusion so that you can rest easy knowing that the pests will never come in the first place. Our team of experienced pest control service providers will work with you to create a treatment plan that will minimize the risk of pest infestation for your commercial property. But what are some common reasons that your commercial property in West Palm Beach might be susceptible to a pest invasion? Climate – Before we discuss any other reasons that your business might be susceptible to an infestation, we have to mention the climate. Here in South Florida, and the greater West Palm Beach are in general, we have a quite desirable environment for pests. Our annual temperatures and humidity make South Florida a prime candidate for pest populations — so regardless of how well kept your commercial property is, it could still potentially be at risk of pest invasion. Clutter – One of the most common reasons of commercial pest infestation is when a property is cluttered and unkempt, thus making the property a prime candidate for a pest habitat. Clutter can attract pests in a couple ways, but the most common reasons that pests are drawn to clutter is because they are seeking shelter or a source of food. If a commercial property is cluttered and is littered with food and water, it becomes quite desirable for pests that are looking for a new home. Chances are that if your property is cluttered that you will contact us because you have an infestation, not because you want to prevent one. Our team of West Palm Beach pest control service providers will work with you to create a pest treatment plan, as well as advise you on how to avoid an infestation in the future. Exterior Damages – While yes, pests can find their way into your commercial property by simply scampering in an open door or catching a ride on items brought to-and-from your business, they can also find their way in via damages to your commercial property. Being located in a coastal area, commercial properties in the West Palm Beach and its surrounding cities are quite susceptible to the occasion tropical storm — but we don’t need to remind you of that. However, damages caused to your commercial property as a result of these storms can lead to cracks, crevices, and other convenient entryways for pests. To ensure that pests do not have a way into your commercial property, contact us and request an inspection from one of our experienced West Palm Beach exterminators. At Native Pest Management, we utilize integrated pest management techniques to ensure that after the pest removal process that your West Palm Beach commercial property will stay pest free. So next time you need pest control services, don’t simply search “commercial pest control West Palm Beach”. Give us a call instead. Our team of experienced pest control services providers will help you get your property back to normal in no time so that you can continue your services as usual — never even skipping a beat. Below, we have listed a few of the common commercial properties that we provide pest control services to. If your property type is not listed, simply contact us and inquire about our services. When you contact us in regard to a commercial property pest infestation, a suspected infestation, or even simply in preparation to ensure that you do not end up with an infestation, our team of professional pest control service providers will come visit your property, discuss your concerns, and tell you the best course of action going forward. Contact us today or request a free estimate! If you are currently experiencing a pest infestation in the West Palm Beach, Boynton Beach, Delray Beach, Jupiter, Wellington, Lake Worth, and Boca Raton areas, we urge you to contact us at Native Pest Management. We will work with you to create an integrated pest management plan that is suitable for your commercial property — because it is our goal to get your business back to normal as fast as possible. We look forward to ridding your business of pests so that you can worry about the things that matter most!